Here’s a piece of equipment that can be used with just a normal chair. Small enough to take to the office and use there although you won’t be working at your desk while exercising with this one. If you would like to use this at your work it would be a great thing for breaks or even on conference calls. You might want to mute your end of the phone though or else the other people on the call might be concerned about your heavy breathing. Since the Stamina In Stride Total Body Cycle has such versatility and is designed for easy portability (it weights only 13 pounds) and use with a regular chair – it would also be a good selection for persons who need to have choices for chair exercises. 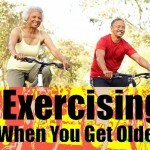 This would include the elderly and obese persons who find standing workouts difficult or tiring. 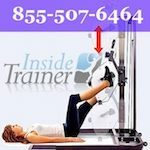 Other positive features for this seated exercise equipment is the simple adjustment that allows you to stay seated while changing to upper body exercise. Simply by un-screwing the large knob you can swing the pedals into the opposite position so you can remain seated and pedal with your arms. 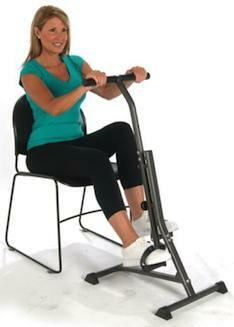 This allows for a large range of motion and varied workouts while you remain seated. There is also a tension knob so you can adjust the tension to your workouts, increase the tension and you will burn more calories. The foot pedals are non slip and have straps as well so your feet won’t slip off the pedals easily. 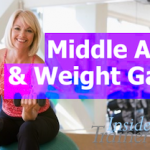 This is a light weight piece of exercise equipment and although not suited for rough treatment, it would be just right for you if you need to get moving. Fitness is a progressive thing and by incorporating chair exercises into your work day – or any day for that matter – you will burn calories and become fitter. The exercises with the Stamina In Stride Total Body Cycle that you can do would be a forward pedal, a backward pedal, and upper forward and backward as well. These movements not only will burn calories but they use different muscles. The forward chair peddling will work to tone your thighs. The reverse peddling will also work your thighs, but if you have the straps set so you can be ‘pulling’ with your feet you will also work your hamstrings (the back of the upper leg) for a full shaping. Switch the pedals and while still exercising seated your forward arm peddling will help to tone your arms. Forward will work your triceps (that area where the flesh sags under our arms) and the backwards movement, again by pulling you can work your biceps to help shape your upper arm. These movements will also be working and toning the area where the fat builds on the upper back and under the arms. Having a functional piece of equipment for chair exercises can be motivation enough to get you moving towards your weight loss and fitness goals. 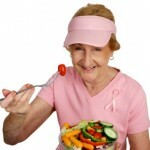 Go here to learn more about the Stamina In Stride Total Body Cycle. This is a stand-alone piece of equipment that does not need to be propped on your desk. From your seat you can pedal your feet for a cardio and a workout for your legs. Then just switch the pedals around to work your arms by operating the pedals with your hands. Well made with a steel frame and weighs only 10lbs. so it’s still portable, lightweight, and simplistic in its design. Stores away easily too. Tension knob to adjust the resistance for both legs and arms. 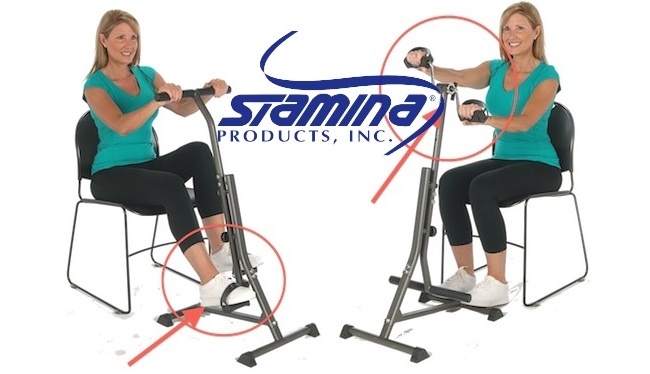 The handles are used for gripping when pedaling with your legs to keep your body in good posture as well as provide added stability to the machine. The pedals are made of a non-slip material and have straps to secure your feet into place. Light weight and durable with steel frame. Portable and stores easily. Two simple controls, one to reposition pedals and the other is tension control. For the money it is an excellent buy and holds up to use. Handlebars are a great feature for stability and holding you in proper position. It isn’t really designed for multi-tasking. If you are using this at work, consider setting a timer and taking a full break when using it.